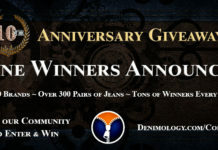 One of my favourite men’s denim brands is Edwin, so I am delighted to be able to offer one lucky person the opportunity to win £200 to spend on jeans by Edwin courtesy of BaggaMenswear. BaggaMenswear is an award winning online retailer stocking brands such as Edwin, PRPS, Nudie, Armani, G Star and Evisu. New stock is added every week, new brands every season and they deliver worldwide.